Eleanor was a French duchess. She later became queen of France, divorced her husband, and then became queen of England a short few months later. 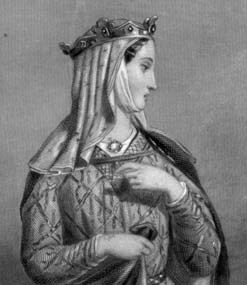 When it was all said and done, she held the titles of Duchess of Normandy, Duchess of Aquitaine, Countess of Anjou, Countess of Poitou, (former Queen of France), and Queen of England. 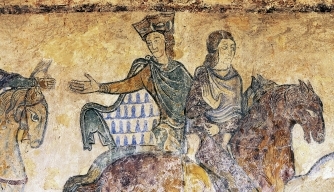 She was the first female in 200 years to rule over her land of Aquitaine (Brooks 1). When her father died, she became the richest heiress in ALL of western Europe (Brooks 13). She was held under house arrest by both husbands for behaving “improperly” (meaning she acted of her own will and defied their commands). 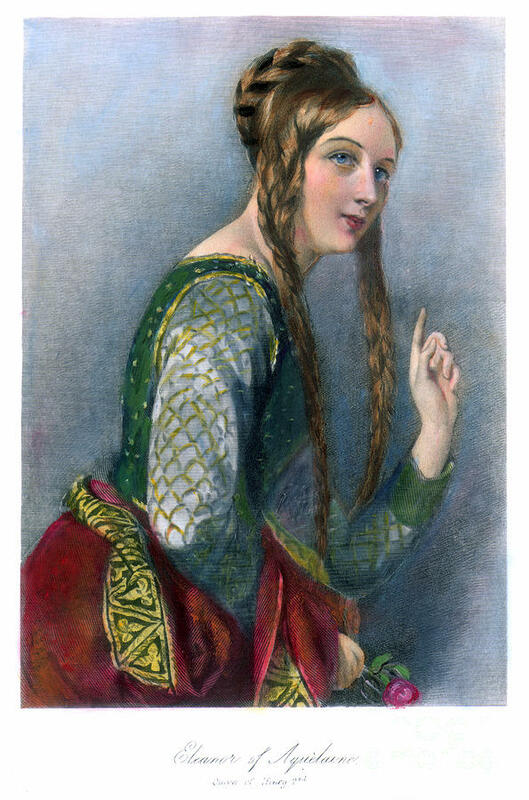 It is thought that the modern version of the fairy-tale Queen Guinevere from the stories of King Arthur was modeled after Eleanor herself (Brooks 180). She was a businesswoman, a patroness of music and poetry, mother of 10 children, a political leader, crusader, and a cunning strategist. She lived from 1122-1204, which means she died at the age of 82. This was highly uncommon considering the average life expectancy for women during her time was in the 40s. To understand a little more about Eleanor, we have to know a bit bout the time during which she grew up. And what better topic to start off with than food! It’s certainly the most important one, right? 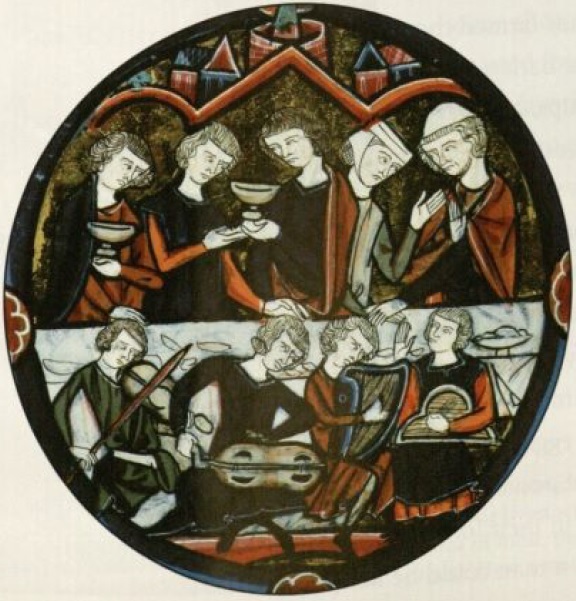 The nobility during Eleanor’s lifetime used any chance they could to hold feasts! They used them for celebrations or a show of wealth when hosting the royal family or other members of court. Feasts were meant to be extravagant and a loud affair with music playing, much dancing, and people chatting, and it had plenty of mess to go along with all the noise. The hosts might serve food like oysters, different types of fish, and lobster. Guests munched on roast pork and venison cooked on a spit, different breads and vegetable pies, as well as duck, chicken, peacock, and even cranes (Brooks 15). The use of forks was not common during Eleanor’s time so men and women ate food with their hands, though sometimes they had the help of knives or spoons (Brooks 16). 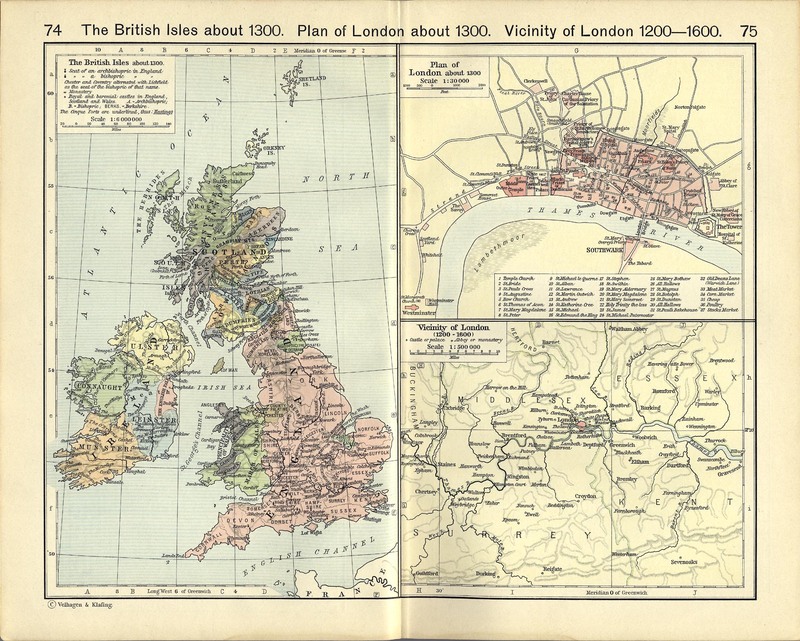 The French most commonly drank wine with their food, while the English served both wine and beer. Drinking water was not an option. Too dirty! For dessert, they finished with different kinds of figs (you know, those things inside of Fig Newtons), fruits, and a variety of berries, accompanied by sweet tarts (no, not the candy) (Brooks 15). Lords and ladies most often wore clothes made out of soft wool or linen. (Fun fact: linen was most commonly used for underwear, by all classes, during the Middle Ages.) The more wealthy nobility and royalty might have clothes of silk embroidered with gold thread and cloaks outlined with fine furs and fastened with jeweled pins. Dyed clothes, especially red, were hard to come by and, therefore, very expensive. As a result, royalty and the richer clergymen, like archbishops, cardinals, and the pope, used red clothes to display their status (Plain 49). Women of nobility often had sleeves of such length that they swept the floor and wore veils held down by gold circlets to cover their hair. Once married, they were not allowed to be seen in public without their hair covered because their hair was considered “to be a snare for the Devil” by the church (Brooks 27)! “…a gown of pure silk with tight-fitting sleeves designed to show off her delicate wrists, as important as a slim ankle is today. Around her waist she wore a jeweled belt. Over her gown fell a long red velvet robe trimmed in fur; its full sleeves with their wide openings tapered to points that almost touched the ground. Over her hair was a scarf called a wimple, held in place by her gold crown… Her wrists were laden with bracelets, and long pendants hung from her ears” (Brooks 27). 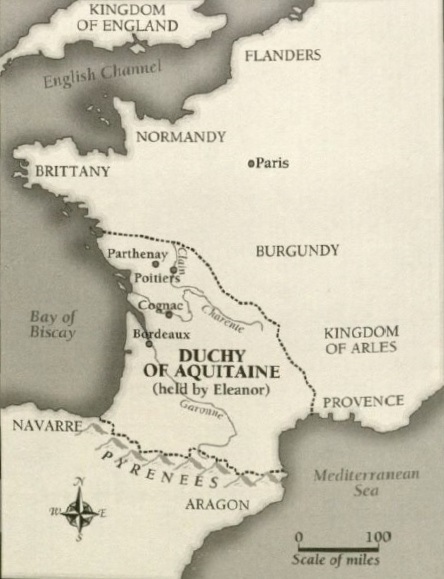 Eleanor grew up in the French duchy of Aquitaine until the age of fifteen. 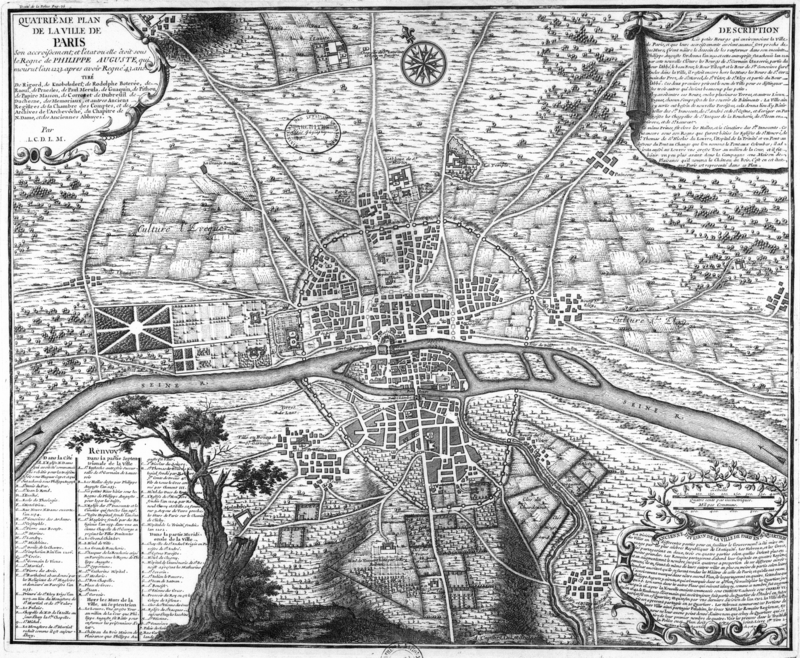 This land was over twice the size of the land owned by the French royal family, stretching from the Loire River to modern day Spain, which made her family wealthier and more powerful than even the king. The duchy received its name, which means land of waters, from the Roman settlers for its many rivers that created fertile and rich soil. This soil allowed for the abundant growth of raspberries, strawberries, and dark cherries, the thriving of sheep in the meadows, and the planting of “acres of vineyards, olive groves, and wheat fields” (Brooks 10). 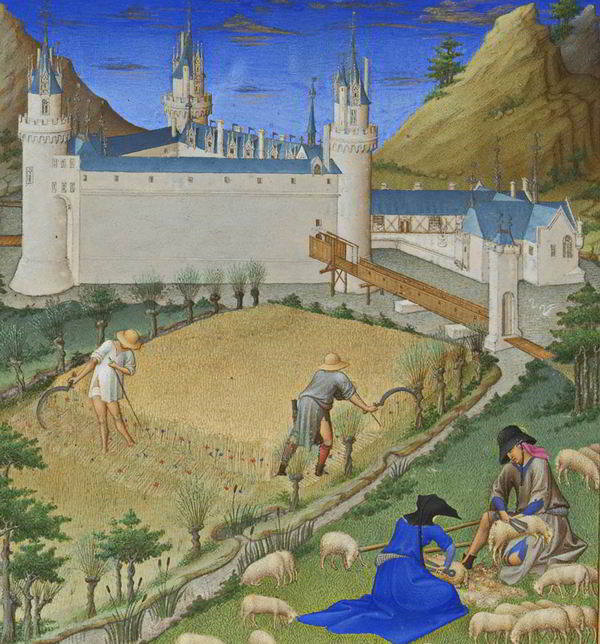 From the window of her castle in Poitiers where she spent much of her childhood, she would have seen the lands, fields, and rivers rolling on for miles. She even often traveled them with her father which helped her prepare for the MANY times she would have to do it in the future. Eleanor’s mother died when she was eight years old, which left her education in the hands of her father and tutors. From a very young age, Eleanor was headstrong and determined, intelligent and quick to learn. She had few restrictions on her behavior and actions, which likely encouraged her unyielding character. She knew how to read and write, which was an uncommon achievement for medieval women. In these ways, her young life and education were unlike those of most noble girls during her time. However, like the other girls, Eleanor also learned how to sew, weave, and embroider. Her tutors taught her how play the harp, sing, and dance. She could also ride a horse better than any boy and “often preferred riding astride to the more ladylike sidesaddle” (Brooks 11). 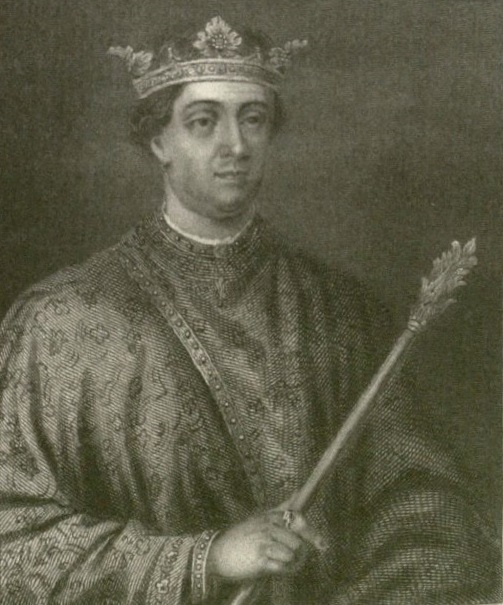 At the age of 15, Eleanor married Louis VII of France and became queen just a short few months later. She immediately moved to Paris where she lived in an already hundreds of years old castle built by early Franks. The castle sat on a little island, called the Île de la Cité, in the middle of the Seine River. The view from her window here was quite different from the one in Poitiers. On one side of the fortress, she would have seen streets crowded with merchants and lined with old wooden houses that cast shadows over all those that passed beneath. Goats and pigs strolled freely along the dusty roads and vendors yelled out the prices of their goods to passersby. Adding to their loud shouts were the sounds of creaky mill wheels and clanging church bells (Brooks 11). On the other side of her little island, she would have seen the college, “the most popular center of learning in western Europe and swarmed with students who came from all over to study there” (Brooks 20). Eleanor wasted no time in making her new cold, bare castle feel more like home. 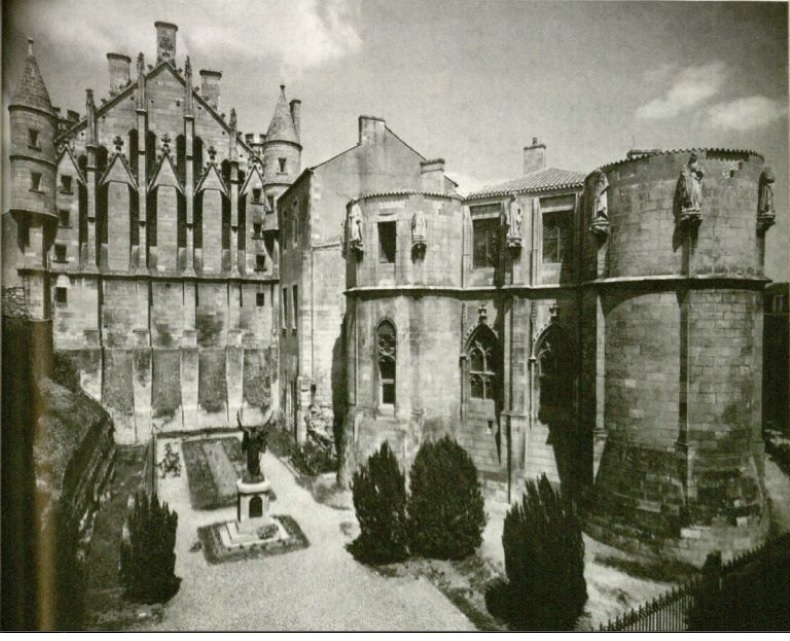 Some of her first acts as lady of the house were to liven up and beautify the dreary castle, much to the dismay and disapproval of her mother-in-law. She hung colorful tapestries on the walls, widened several of the narrow slits into windows, and had shutters attached to keep the air and precipitation out during the cold weather. She had masons build new fireplaces and even dismissed the master of the choir and then hired a different one after hearing how poorly trained the royal chapel was. She established new rules for the servants, insisting they behave more professionally, dress more sharply, clean their hands before serving food, and change the rugs on the floors more often since they were covered with animal droppings from birds and dogs, which left the place smelling like a zoo (Brooks 21-22). However, being a rich, young, single woman without the protection of a male was very dangerous at that time. Anyone could kidnap Eleanor, force her into marriage, and take her land. Knowing this, she wasted no time in marrying again, having already chosen her new husband before divorcing her old one. 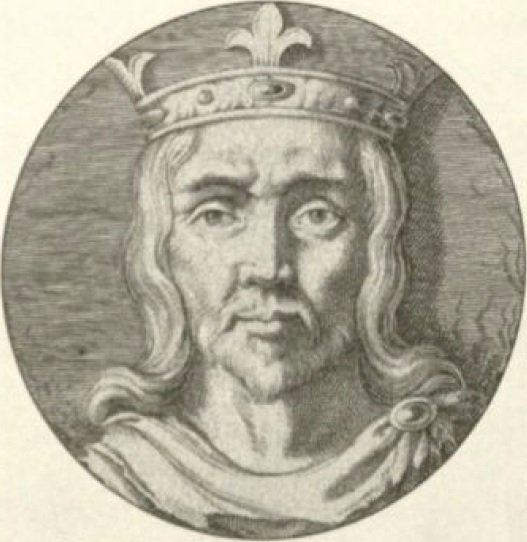 This man would become King Henry II of England just 2 short years after their marriage, giving her another title of Queen of England. As England’s new queen, naturally she had to move there. 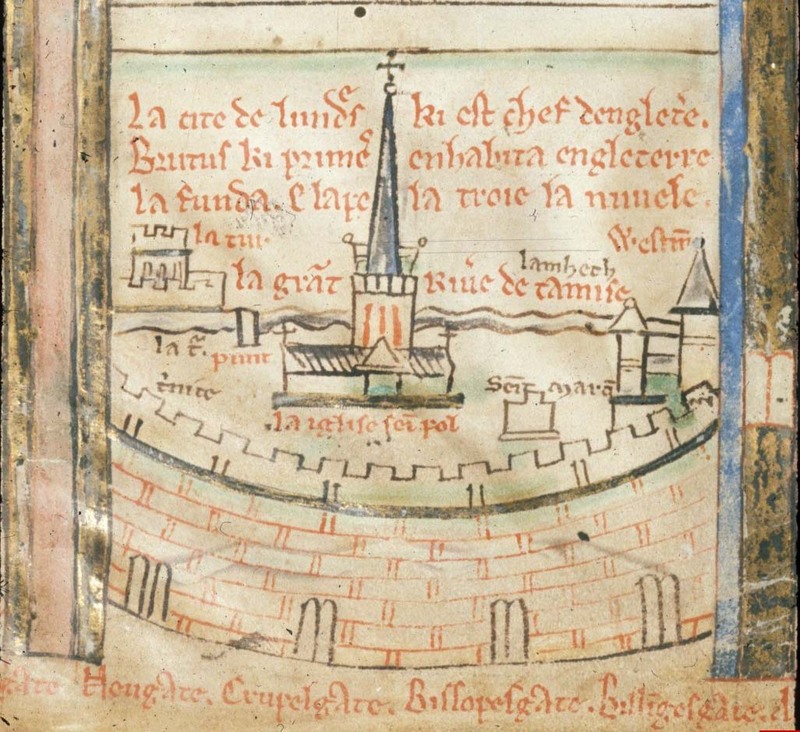 Once in England, Eleanor and her husband moved into a royal manor near the Thames River, as the battles between Empress Matilda and King Stephen had severely damaged the royal palace of Westminster. 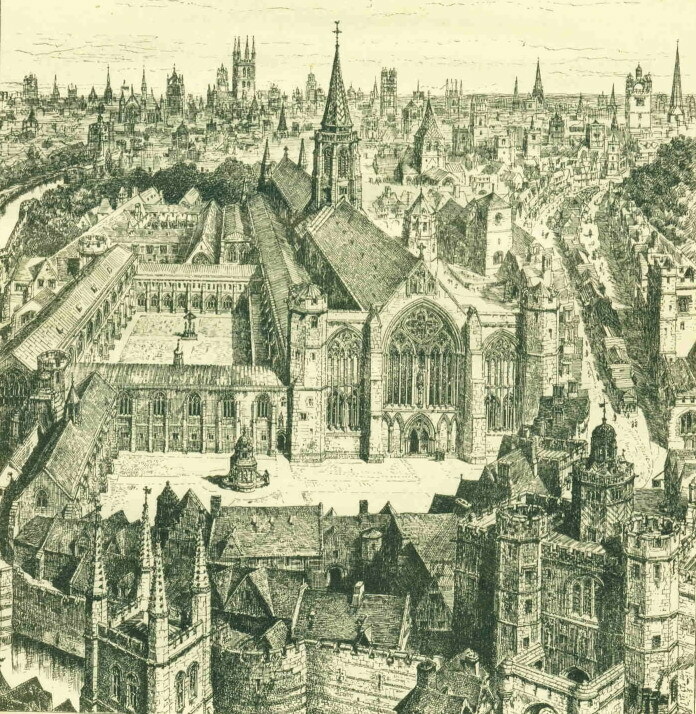 From her manor window, Eleanor had a view of the Tower of London and St. Paul’s Cathedral (Brooks 74). In the winter, she saw young men “gliding on frozen ponds and marshes, using horses’ shinbones strapped to their boots for skates”(Brooks 74). On warmer days, she could see these same young men jousting down the river in small boats. She also would have seen plenty of ships making their way up and down the Thames, loading and unloading cargo at the docks. And just as Paris had its many smells, England too had its own stench of beer, wool, and fish (Brooks 74). 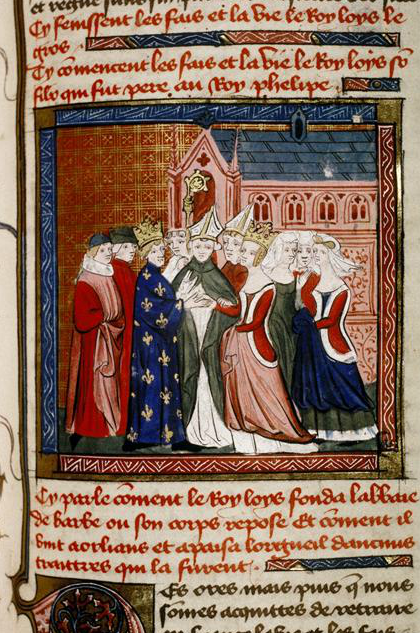 Eleanor’s first acts as the English queen were much like those as the French queen. She would not live in a place that was not to her liking so she soon set out to make her home more to her taste, filling it with life and color. She brought with her a freer lifestyle uncommon in the English court, as well as new poets and musicians, who brought with them different styles and genres. 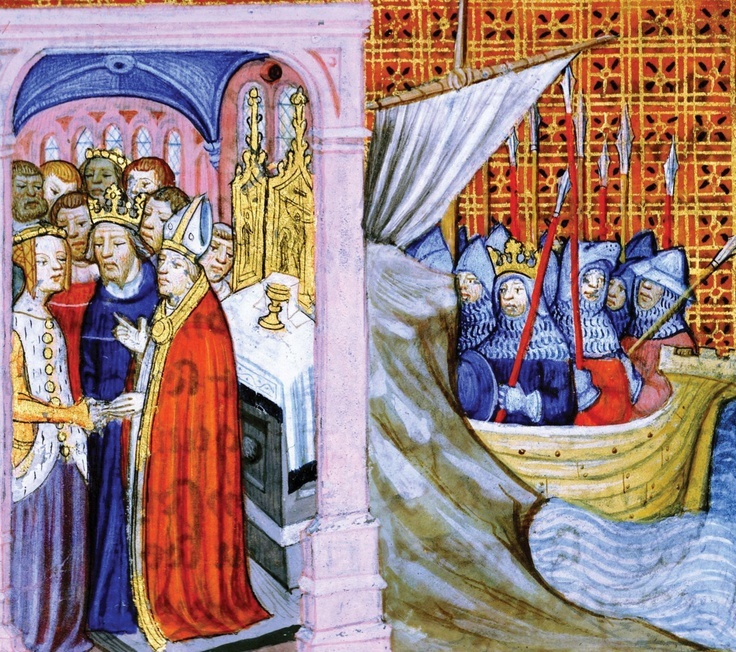 She introduced her favored ideas of chivalry and romance that were so popular in Aquitaine, as well as even more fanciful tales of King Arthur and his beloved Queen Guinevere . Also as in Paris, she helped change the music performed in church, having the choirs sing in unfamiliar, but beautiful new harmonies (Brooks 79-80). Firstly, her education set apart from other women. Not every female could read and write, but Eleanor could do both. She was allowed to rule over her land even after marriage. Often, if it so happened that a woman received her father’s land after his death, it would pass to her husband or son. While Eleanor’s land “officially” belonged to her husband, then sons, she was in charge of maintaining peace, traveling throughout the lands to speak with fiefs, visiting towns, business and land exchanges, and the upkeep of the castles. She had her own business importing French wine from Bordeaux to London. She actually owned the dock itself where the wine was unloaded from her land of Aquitaine (Brooks 79). She was an astute politician. She was in charge of domestic affairs in England when her husband, and later her sons, were away. She played the biggest role when raising enough money to pay the ransom for her son Richard when he was captured by the Holy Roman Emperor. 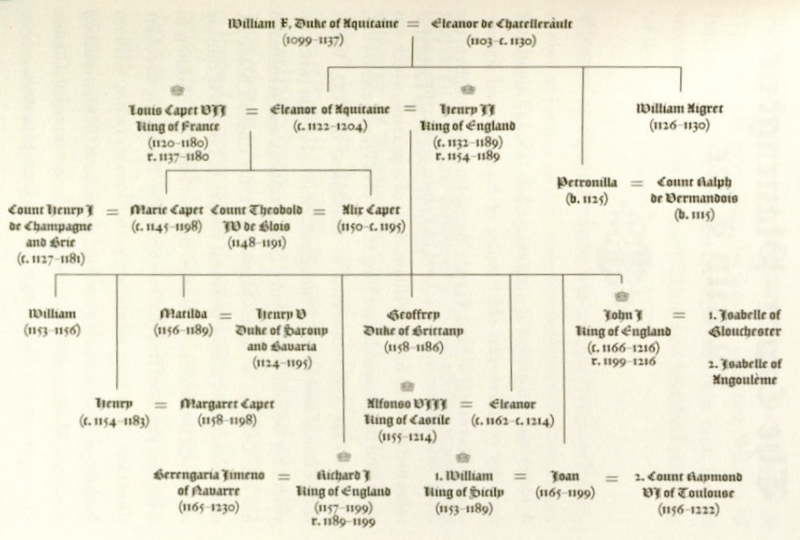 Also, when her youngest son, John, became king of England and was losing much of the land his father had fought to obtain, it was Eleanor who, at the age of 75, was heading an army to defend his honor and his land (Castor 217). And it was she who helped secure a treaty between the French king and John so that he would not lose ALL of his land (Castor 219). She also changed court behavior: Eleanor helped popularize courtly love and the romanticized chivalrous knight that would live on in European courts hundreds of years after her death. 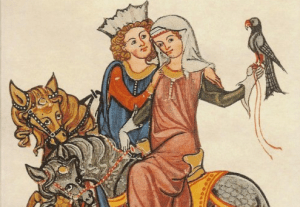 She and her ladies formulated a code of conduct for the men of her court detailing how to behave like civilized young knights who “treat women with gentleness and respect” (Plain 34). It covered all sorts of topics like what gifts men and women could exchange or how men were to obey every command of a lady. She created these ideas, not because she needed a hobby or something to pass the time, but because she believed that women were superior to men and deserved such treatment. Since a young age, she lived by her belief that women had the right to make their own decisions and it showed through in the atmosphere of her court (Plain 34). Upon the reef (Plains 71). I pledged to you this long time past. So long as life in me shall last (Brooks 107). Queen of beauty and largesse [generosity] (Brooks 81). Eleanor’s story has been retold and remade many times. She had such a fascinating life and was involved in so many major events that she appears in a vast number of tales in both movies and books. 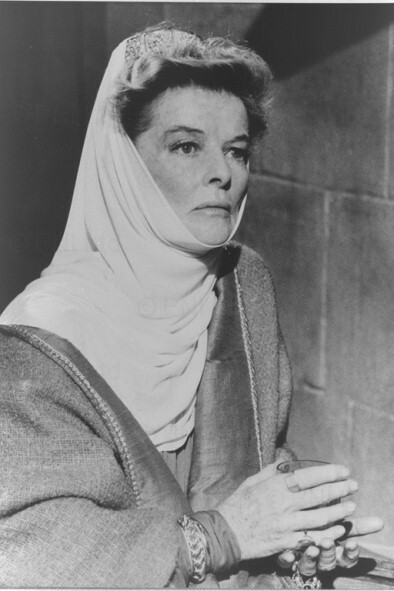 A couple of the more popular films featuring pieces of Eleanor’s story are Robin Hood (you know, the one with Russell Crowe) and The Lion in Winter, based on a novel by the same name. If you would like to look at a list of all the movies and TV shows in which “she” makes an appearance, click here. If you are not interested in those, you have many novels to choose from as well! Sharon Kay Penman wrote several fictional stories about life in Eleanor’s court and recreates the danger and conspiracy that seemed to constantly encircle her. Kristiana Gregory wrote a book from the point of view of a 15 year old Eleanor. Written in the style of a diary, she helps the reader imagine what it must have been like for young Eleanor, living without a mother and knowing she was one of the most wanted women in Europe. If you are looking for some exciting historical fiction reads, you can click here. Here is a short documentary on Eleanor. 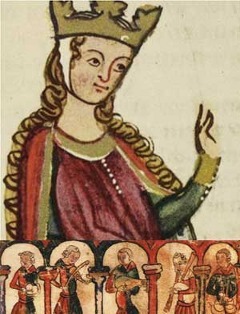 It also includes the story of Empress Matilda, her mother-in-law. Eleanor’s story starts at 37:00. Medieval history may not immediately intrigue and captivate you, but give this gal a chance and you will be hooked! Her story has murder, mystery, war, love affairs, combat, and much more! Who wouldn’t want to find out more about that?